In the sports betting world, online, golf is the game for the niche section of gamblers. If you are the aficionado of the game and wish to earn some handsome amount by betting on the Masters or Ryder Cup or any other major golf tournament, be ready to research a lot. Watching golf on TV is one thing, but betting your hard-earned money on the game is a completely different ballgame. You have to plan a strategy in every step- right from the selection of tournament to the type of betting to choosing the correct book-maker and so on. If you are interested in betting on any major golf tournament, then the following 5 pointers will give you a brief view of the golf betting the world. The math behind golf betting odds is somewhat complex. A golfer’s performance is quite volatile. So, in one week, he can outperform his rival and rank the elite ’26.0’ shot. On next week, he can show a poor performance and be an almost outsider 200.0 ranker. So, by considered this unsteady nature of the beast, one should consider the odds and how much he/she is willing to win or lose in the game. Do you know what determines your profit in a match? It’s multiplying your bet with the odd and then subtracting the amount of your stake again from the total result. The nature of the bookmaking business is- minimizing its chance to parting with money. So, in other words, if you are going to be a loser for a long period, then it will be the gain of the bookie. What should one do to avoid such circumstance? The answer lies with putting a stake on the value bets. Only value bets can incur you loads of profit for a long period. In short, just remember that, if the numerical formula of value bet results in more than 0, you can safely put your money on it. In the world of betting on the Masters, a bookmaker can make or break your deal. That’s why it’s even more important to examine ‘the one’ with care and research. Trustworthiness is the main factor that should determine which bookmaker you should go with. Does it have a long standing in the industry? Will you be offered a bonus when you will register with the site? Also, check your enthusiasm, even if the bonus sounds great. Many bookmakers, to lure customers, present great sign-up deals but hide the stringent clauses. Also, the online gambling space is full of fly-by-night companies that can leave you empty handed. So, be cautious. Apart from reputation, market odds should determine your decision to select a bookmaker. Here the comparison is the key, as odds can be different in two separate bookie sites. So, zero on one, which will provide you with the best odds. 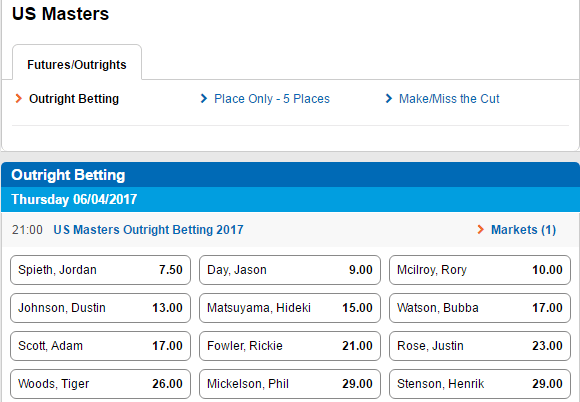 Live streaming of the golf match on the bookmaker’s site is the latest trend catching up first. Skybet is one such brand that offers its customers with an app for streaming videos. Do you hate looking at spreadsheets? Does statistics as a subject give you a headache? Then roll your sleeves up and get ready to dabble into the world of stats and spreadsheet before betting on the Masters. Here, we are discussing how to become a pro golf gambler. If you aim to be one, then these two attributes are calls of the season. How to go about making a spreadsheet to hone your golf betting skill? If you are familiar with MS excel, then keep a record of your betting history. You should save the master tournament you are betting on, the date, the amount you have put as a stake, the bookmaker’s name and the outcome. Have you heard of greens in regulations (GIR) or putt? Both are related to the performance of the player on a specific golf course. If you are good enough to extract the meaning of statistical data involving them from the sportsbook accounts, you are ready to rock as an online golf better. Winning a PGA tour or Masters Cup ensure that a golf player can stay in the top bracket of the world ranking, with the immunity of not participating in any grand slam for two to five years. It also means that the player’s performance in in-between matches won’t hamper his/her status. Don’t you think that as a gambler, this is the sure shot way to win big? You must be extremely cautious while putting your stake on a relatively unknown player or someone who hasn’t won any trophy in the ongoing Masters in the past. Apart from the player, bonus deal is another segment to show your pickiness. Right now, the online space is brimming with bookmakers who are presenting stellar offers. While Paddy Power will give you some truly remarkable prizes on every key tournament your bet wins, Skybet presents its patrons with above average incentives and free gifts on the win. There is a site called Bookmakers Free Bet Page, which will give you an all-round glance on the various offers promoted by the prominent betting tips sites. Subscribe to a good sports channel that covers major golf tournaments throughout the year. Rummage through the internet to find sound betting tips on golf. There are multiple threads on the internet where experienced gamblers discuss and exchange recommendations to each other. You can contact to them or post your queries on the thread. Some expert sites organize annual tipster competitions and following them closely will teach you many things regarding the game. Like gambling on any other sport, golf betting to requires your good fortune to be profitable. But as steering your luck into the right direction is not always on your hands; following the 5 tips above can better prepare you to face the challenge.